So, you are in a bit of a pickle. You bought a good and reliable electric toothbrush, but now that your battery is dead, you are back to a basic toothbrush. Frustrating, I know. But, bear with me for just a minute and do not throw out the batter or the Oral-B unit. Perhaps we can help. 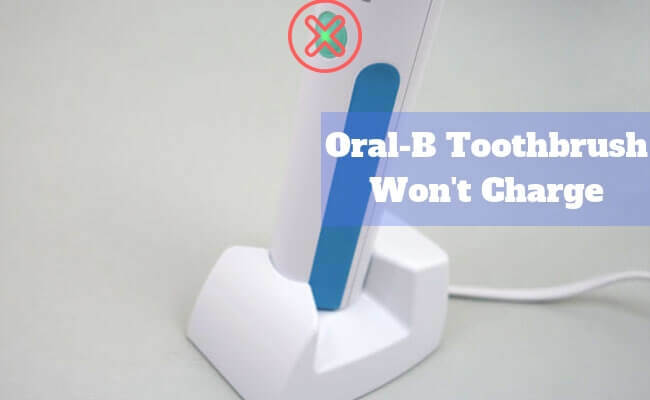 Below are some of the obvious reasons as to why your Oral-B is not charging. Perhaps you can solve your crisis in an instant. Make sure you use it until the battery is drained before the next recharge. This means, avoid recharging between uses as this may negatively impact the battery and its charging capabilities. So you’ve just plugged in your Oral B toothbrush and immediately it’s not showing the green charging light. Before you start panicking, relax. Just give it some time. If the battery in your toothbrush was entirely drained during brushing, the light won’t appear right away. It can take up to 15 minutes before the green light starts blinking to indicate charging mode. For these toothbrushes to accept a charge they need to be turned off. Trying to charge it while it’s on won’t be fruitful. This means even if the battery has been drained, be sure to turn it off first before placing it on the charging base. Every battery has a maximum service timespan. After some time it’ll stop responding due to wear & tear. But you don’t have to throw your toothbrush out—simply replace the battery. A faulty charger is another reason why your Oral B toothbrush may not be charging. The only way to be sure is to test it with another compatible charger. If it works then it means that particular charger is broken. Do you have any more questions? Please leave us a comment below. My toothbrush is not lighting green when charging even after a period of time. Why? Where do you buy a new battery? Would Target have it? I just bought my sonicare toothbrush haven’t even used it yet. The toothbrush head is attached correctly but when I put it on the charger, no light is coming on and no charge is going to the battery. What do I do? I don’t want it be a waste. I have a Braun 3764 Oral B Toothbrush (Triumph Professional Care) and will not charge on battery.. Do I need new battery?